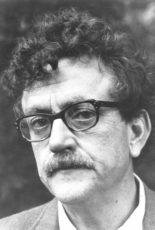 In 1991, while on tour for his collection of essays, “Fates Worse Than Death,” Kurt Vonnegut Jr. stopped in the KPFA studios to speak with the hosts of the “Probabilities” program about his work, his career, and his feelings about life and politics. This interview was originally recorded in September, 1991 and was digitized, remastered and re-edited in 2011 by Richard Wolinsky. This was the last interview of any kind to occur in the off-air studio in KPFA’s old offices on Shattuck Avenue in Berkeley. The new radio station on Martin Luther King Jr Way was already operational but we were able to squeeze in this last one in the old building.